Penny Anderson Associates Ltd (PAA) has been awarded accreditation from Alcumus SafeContractor for achieving excellence in health and safety in the workplace. PAA is principally involved in the environmental sector, specialising in the ecological, hydrological and geological industries. PAA’s most recent clients have included major players such as Morgan Sindall Group plc, United Utilities and Natural England. The company’s application for SafeContractor accreditation was driven by the need for a uniform standard across the business, particularly in relation to PAA’s biological monitoring of watercourses at London Gatwick Airport. Gatwick carefully controls and monitors its surface water discharges to ensure compliance with EA consents. 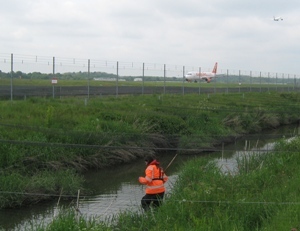 In addition, since 2004, monitoring of the potential influences of the discharges on the ecology of the streams has been undertaken by PAA to aid in the evaluation and assessment of any environmental impacts that airport operations have on the water quality of the Gatwick Stream and the River Mole. PAA’s Managing Director, Sacha Rogers, responded to the award ‘We are delighted that PAA meets the requirements of the SafeContractor scheme. We have always taken great pride in our excellent health and safety record and this award demonstrates the importance that we place on the health and safety of our staff, clients, contractors and the public”.